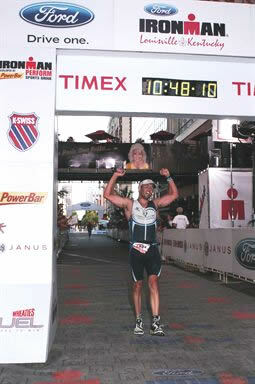 Pokey completed his first full ironman triathlon on 8/29/10. 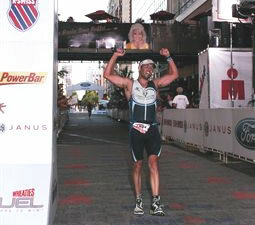 Below is a synopsis of my Ironman event, with some thoughts I had during the race. Enjoy! A 2.4 mile swim takes a long time. It�s that simple. You feel like you�re in the water forever, and not going anywhere. You swim, and swim, and swim. You look up, and you�re not at the first buoy yet. Eventually, you see that you�ve made some progress. You even notice that you�re passing people � things can�t be all bad! The LouIM swim starts with a time trial start, so you�re not immediately fighting people in the water. You do that 10 seconds AFTER you get in the water. The water temperature was warm (84 degrees) and not too choppy. The swim, for me, was fairly uneventful. I worked moderately hard, tried to not let my mind stray, and focused on my form. I felt some tightness in my hip flexors, which I thought was strange, but didn�t really worry about it. After swimming upstream, around an island, then back downstream for, what seemed like forever, I finally approached the swim exit. My arms and legs did not feel like moving differently from what that had done for the past hour, but eventually loosened up in transition. After loading up my pockets with gels, tools, etc. 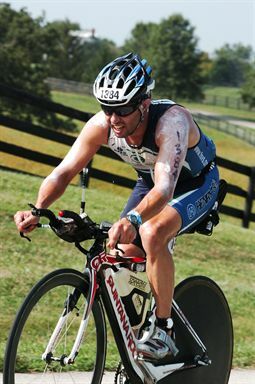 and putting on my helmet and shoes, I made my way to the bike and got out of transition in a leisurely fashion. As soon as I got out on the road, I took off! Easily riding at 22 � 25 mph on the flat road, I was blowing by people. I reminded myself to stay comfortable. After all, I have to ride for 5+ hours! Even with the speed I was traveling, my friend, Spencer, caught me after about 15 miles. He and I rode together for a while, until he decided to push the pace beyond what I wanted to do. The hilly sections didn�t appear too hard � yet, and I felt comfortable for a good portion of the ride. As an added incentive we rode past a festival twice. My sister and Spencer�s family were at the festival to cheer us on. What great motivation to get through the hills and put up with the heat (now reaching over 90 degrees). After about 50 miles I started running into problems. My IT band on my left leg and my right knee started hurting. 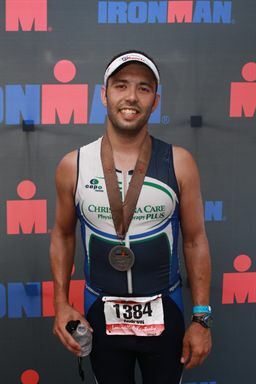 After another 30 miles, I couldn�t push much with my left leg and started losing time. In the back of my mind, I wondered if I would be able run. My IT band hurts the worst on the run. In addition, the wind that had helped me on the way out, was in my face. I managed to hobble the bike into transition, where I saw Spencer just getting his shoes on. I somehow had caught back up to him! This would end soon as he is a much stronger runner than I am. I informed him that I was having troubles, but would do my best to run. I took my time in transition getting changed and stretched out my legs and knees the best I could, hoping I could make them run. I cautiously left the transition area and ran slowly to check out my knees. I figured if they didn�t blow up after 20 minutes, I would be OK. Surprisingly, I felt really good for the first part of the run. I decided to push the pace after 20 minutes and ran "within myself". It was hot!! However, I was motivated by passing runners, constantly. Many of the runners had killed themselves on the bike and were walking within the first mile. I decided that the best way to conserve my energy was to run from water stop, to water stop, and walk at the water stop to make sure I got enough nutrition. This worked out well for first 18 miles. At mile 14 (the turnaround for the second loop), I ran past my screaming sister and Spencer�s family. I nearly cramped from the excitement of seeing them! 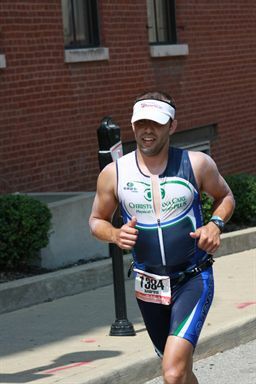 After 18 miles, the heat, humidity, lack of shade, and hours of racing caught up to me. I had to walk before I got to the next water stop. I walked a couple yards, turned a corner and there was the water stop!! If I held on for 30 more seconds, I would have made it to the water stop. I plodded on for the rest of the marathon, running with another guy who had done a couple ironman races already. The last 3/4 of a mile are the best. The streets are lined with people cheering and music blasting. The road is closed, so you run right down the middle of the street, with skyscrapers all around. After a couple of short turns, there is a 1/4 mile run into the finish. Here, the crowds are the loudest and you can�t even feel your feet hit the ground! The streets are barricaded to protect the runners from the spectators and the Ironman symbol all around. After being escorted by the volunteers through the finishing area, I met up with my sister. We hugged and even cried a little. Spencer was also waiting and we hugged. The 10+ hours of pain was worth that one moment. It will remain with me forever. "Here's how you run a marathon. Step 1: You start running. Step 2: There is no step 2."